OPRI is proud to offer a full range of RGP contact lens polymer options from Dk 10-153 (Fatt method) for the manufacture of custom contact lenses. All OPRI polymers are designed to promote optimal comfort and wettability combined with long-term eye health and superior visual correction. 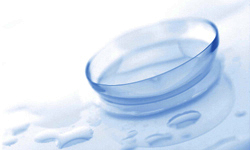 Custom gas permeable contact lenses made from OPRI polymers offer a broad range of features and benefits allowing the independent manufacturers and eye care professionals alike to design lenses that meet patients’ needs for lens comfort, wetting, deposit resistance and overall performance. UV absorber is an available option along with other locator tints. OPRI’s premium fluoro-silicone-acrylate (FSA) products are a major enhancement over the previous generation of silicone-acrylate (SA) and many first generation FSA polymers. OPRI expertise in fluoro-monomers led it to utilizing a truly unique fluoro-component reducing its dependency on silicone content providing increased performance. And has further extended the oxygen permeability (Dk) of these polymers without compromising other critical polymer performance features. These innovative premium polymers address lens design performance requirements as well as surface characteristics that meet patient comfort needs. OPERMTM F60 (Dk62) is a fluorinated polymer issued a PMA by the U.S. Food and Drug Administration and approved for the US market. Since its inception, OPERMTM F60 has received worldwide acceptance as a “workhorse” polymer and is currently the most widely utilized brand and “Flagship” of the many optical polymers OPRI has developed. Due to its ample oxygen transmissibility, deposit resistance and with proven performance in maximizing on-eye lens comfort OPERMTM F60 has increasingly become the polymer of first choice. OPERMTM F60 is both a problem solver in overcoming lens comfort issues and a problem preventer by offering patients excellent oxygen delivery and a superior hydrophilic surface. It is available in standard blue and green tints. In addition to standard corneal and specialty design core lens diameters, the management of irregular corneal conditions (in non-diseased eyes) including keratoconus, pellucid marginal degeneration, post-penetrating keratoplasty, post-radial keratotomy and post-LASIK surgery very often requires a larger core diameter GP lens to help maximize visual acuity while ensuring; optimum eye health. OPERMTM F60 polymer provides this capability. OPERMTM 30 (Dk31) is a silicone acrylate approved by the U.S. Food and Drug Administration for the US and world markets. This very stable, stress free polymer has also enjoyed wide acceptance globally. Known for its easy machinability and wearing durability combined with its adequate oxygen transmission have made it the silicone acrylate polymer of choice of many manufacturing labs around the world. OPRI is committed to the timely expansion of its polymer portfolio within the US and global markets providing its manufacturing customers outstanding performance and quality assurance within their product offering. Available in sizes from 18mm to 28mm, with or without cut down. All OPRI FDA approved polymers (shown above) are available worldwide. OPRI has also developed additional GP contact lens polymers to offer the global marketplace. These polymers are extensions of the approved polymers and thus satisfy the desired properties within the full Dk range from 10-153 providing substantial dimensional stability, machinability, wettability and durability. NEW! OPERM HDKTM and OPERMTM F40 were both developed specifically for the global marketplace and contain fluorine which provides supplemental oxygen transmissibility for daily wear with improved deposit resistance and are available in blue, green and gray locator tints. OPERMTM 15 is a silicone acrylate that is similar to OPERMTM PMMA in its optical clarity and machinability, but imparts enough oxygen transmission to make it healthier for daily wear. It is available in blue, green and gray locator tints. It continues to be extremely popular around the world because of its excellent machinability, polishing, optical clarity, durability and low price. OPRI's first hyper-Dk gas permeable material demonstrates our commitment to new polymer development. This premium GP material offers outstanding oxygen permeability (153 Dk using the Fatt method) without compromising wettability, stability or comfort with the performance of a lower Dk material. OPERM HDKTM is inherently wettable and can be plasma treated in the same manner as other OPERMTM materials. This material is for daily wear for ametropia and certain irregular corneal conditions. 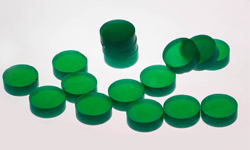 OPERMTM PMMA (polymethyl methacrylate) contact lens blanks are made from ultra-pure methyl methacrylate monomer. The polymer is highly crosslinked for stability, solvent resistance and ease of machining. Half-inch precision ground blanks are available in many colors including: clear and Glasflex, Visimax and Nissel matching shades: #1, #2, #3 and medium shades of blue, green, gray, and brown; violet, pink and yellow. Many other colors are in stock – contact us for availability. 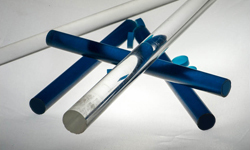 OPERMTM PMMA blanks are available in 12.7mm and 17.0mm diameters. The 17.0mm blank can be machined with a 1/2" shoulder for blocking. Custom polymer applications reach well beyond use in prescription contact lenses. Due to the unique physical properties of these polymers such as their general optical quality, light weight, surprising durability and machinability they offer purpose based functionality within other areas such as Veterinarian Science & Medicine, tactical military optics and many more industries. OPRI through its R&D is quite interested in entering these markets. Please contact us. AQUA->PERMTM 38 and AQUA->PERMTM 55 HEMA based soft lens polymers having hydration factors of 38% and 55% respectively. OPRI has also developed a process to introduce a blue and green locator tint into both of these products. This coloration will not wash out of the lens over time because it is locked within the polymer matrix. OPRI will be introducing its NEW machinable Silicon-Hydrogel polymer for custom lens manufacture to international markets very soon. See the R&D section and visit us again as further information will follow.